Ok so it is called a Monstera deliciosa. It is used commonly as a house and office plant. It has the potential to be HUGE. They are a native to tropical forests in Southern Mexico to Colombia. Frequently I have seen this plant, or a relative in the rain forest exhibits at museums and zoos. The plant itself has very large leaves when full-grown. They start looking similar to the heart-shaped leaves of the Philodendron, but they continue to get larger, and have holes in them. In my mind it seems the holes are to aid sun getting to the lower levels of the plant, especially when it grows in the wild. 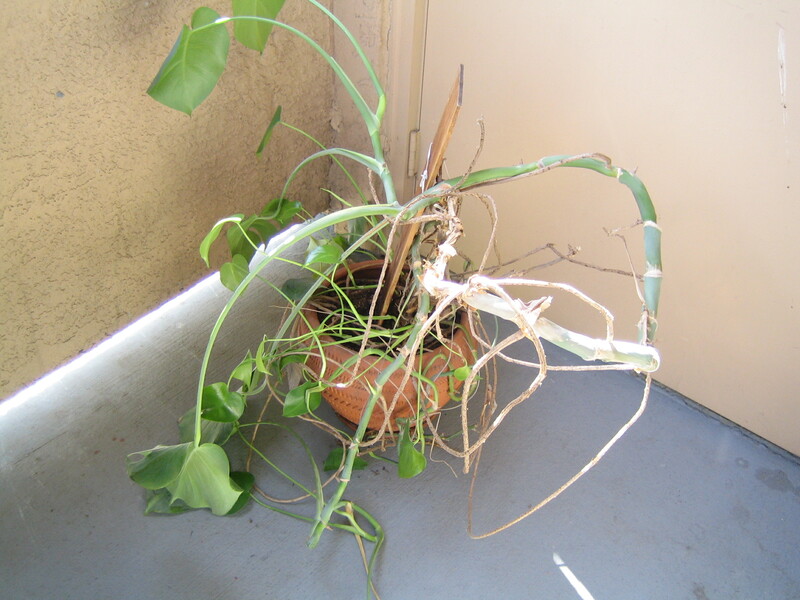 This plant climbs using aerial roots. It is a member of the arum family Araceae. It produces an edible fruit in the wild, and when purposely grown for it. It rarely produces fruit when grown inside. The horticulture lecture is over. Now the point of this post. Monster in water. They are outside since it is warmer out there. 90 degrees today. I am in the process of re-potting this beast. I have had to cut it back… Way back. I have the cuttings in a pitcher of water, waiting for some roots to happen. All of the rest of the plant and the old (very dry) soil it was in have been thrown away. The pot though now holds my Jade plant. 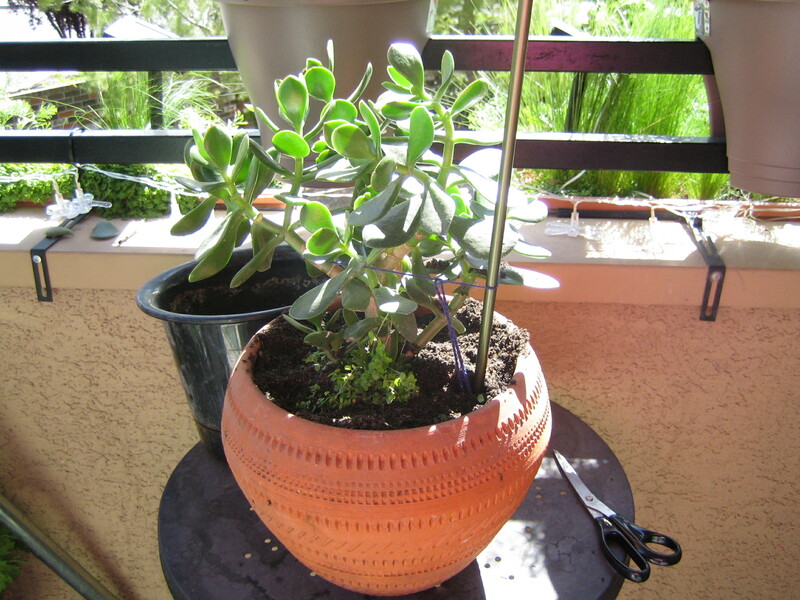 Jade in reused pot. I already can hear it stretching its root out. I have a new, inexpensive pot ready and waiting for the little plants. There is a trellis for it to climb, although I think I will need to create something for the aerial roots to grow into. New pot for the baby monsters with trellis and water bottle ready to go. What are your suggestions for tomato container gardening? I have not had much luck with this. I love the pictures of your garden! Cannot wait to see the sweetpeas in bloom! 😀 Thansk for sharing smiles!